There are so many great places for me to work with couples as their Lake Placid wedding photographer. Wedding photos from Lake Placid are always spectacular. The scenery, the surroundings. The rustic Adirondacks. 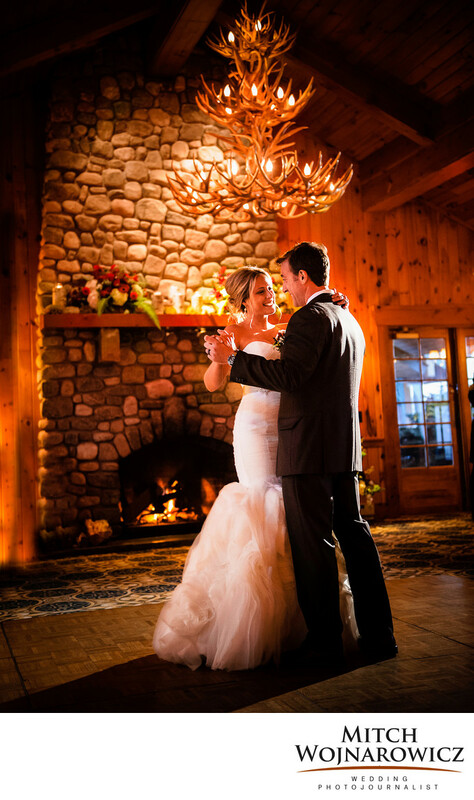 Meghan and Travis chose the Lake Placid Club for their wedding because they wanted to be in the scenery, to see the sweeping views that have brought so many for centuries to these mountains. You see they are both avid hikers and a high peaks wedding would have such a sense of connection to who they are. As they began their first dance, she smiled, just so, at him. A simple moment that spoke volumes about how the two of them feel about each other. I used very subtle lighting, blended in with the natural light of their wedding reception at The lake Placid Golf House. It is a skill to be able to use lighting well at a wedding. It is a skill to not turn a wedding into a full Hollywood production, bit to still make great wedding photos. After all, this isn’t a photo shoot. It’s your wedding day. You and your guests don’t need to be puled away from the events of the day. Nor do they need to be distracted by a “crew” of people at a wedding. As a lake placid wedding photojournalist, I’ll take the images you’d expect at a wedding such as great family group photos and wonderful bride and groom portraits. But my approach goes so much further. I’m always looking for the little moments from the wedding day such as this. The moments at every wedding that speak volumes about the feelings, the emotions, the relationships and the connections with friends. Those are the images that will end up on your walls, prominently displayed for all to see who you really are. And these are images which convey what things mean to you. That goes so much deeper than just a pretty portrait with multiple lights and you posing in some contorted fashion. Look for a real Lake Placid wedding photojournalist. One with years of experience which will make your day smooth and fun. Location: The Lake Placid Club. Keywords: adirondack (60), lake placid club (3), LakePlacid (3).